Resolution! is The Place’s annual festival of new works presented by a range of diverse emerging dance artists…For every evening of the festival there are three short pieces where you get to see a snapshot of brand new work. I put the above introduction from The Place website as a starting point for this piece because I am confused about the nature of Resolution! It seems less a ‘festival of new works’ than a festival of choreographic ideas in search of a work. On the other hand there are some works — like Hannah Buckley’s Woman with Eggs and .2Dot’s I’m sorry you’re leaving — that are not ‘snapshots of brand new work’ but the brand new work itself. So does Resolution! encourage the making of new works or the experimentation with choreographic ideas and form? If the former, not all the works on show appear complete, and if the latter, what is the difference between Resolution! and The Place Prize competition which is currently calling for choreographic ideas to be developed into new work? But back to this evening: the more I think about New Tapestry’s Potatoes & Sauce the more complex I realise it is. It begins by concentrating our attention on the tactile sensation of skin on plastic as Hege Eriksdatter Østefjells’ feet and hands explore a rectangle of plastic sheet taped to the floor like an elongated entrance mat. 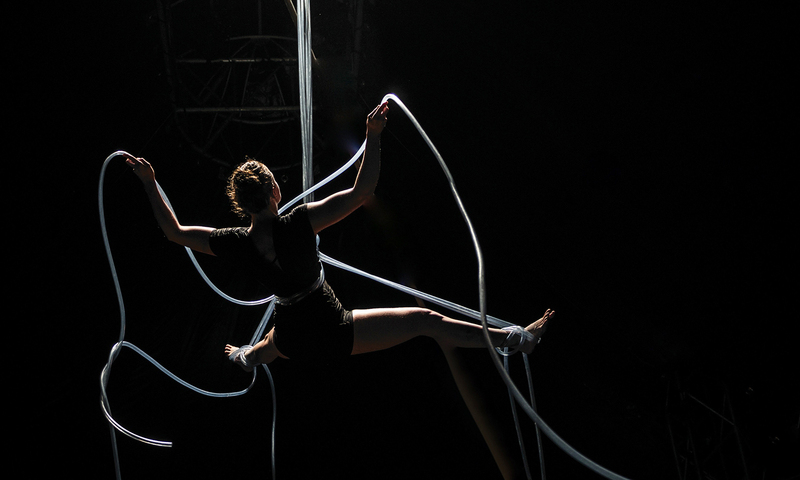 This relates not only to Østefjells’ subsequent aerial work for which she uses a cascade of plastic tubing but also to the first section of (rather indistinct) recorded fragments that originate in coma dreams. There is thus a double suspension in which the dreams float in the air while Østefjells’ body appears to float and swim in a vertical current. The score by Tim Hecker adds another level of mystery to the eerie weightlessness of the whole that plays a gentle dance on the imagination. It is only the manipulation (and sound) of the tubes as Østefjells prepares a body or foothold that reminds us of the mechanics of aerial work but Potatoes & Sauce (the title is somewhere in the coma dream, too) is a welcome exploration of an under-appreciated dimension for dance. Mara Vivas’ Triptych uses memory rather than text as the driver and keeps the physical language unflinchingly minimal. The three women (Elisabeth Schilling, Julie Schmidt and Fabiola Santana) are standing in a single sidelight almost shoulder-to-shoulder with their backs to us as we return to our seats. 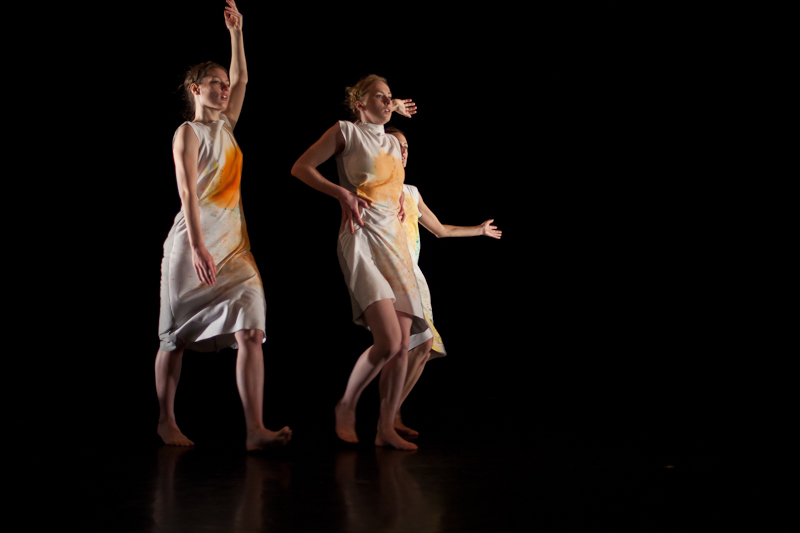 An unintended consequence of the material and fit of the costumes (by Susanne Stangl) is that the nervous muscle activity of the women’s bodies as they wait to start sets up a trembling choreography of its own on the surface of the fabric (the slow gestural arm movements that begin this triptych of three graces seem huge by comparison). Not wanting to suggest any narrative or direction Vivas keeps our focus on the three bodies as one moving sculpture by keeping their gestures in a similar register but at the same time the three women are subtly playing with their spatial relation to one other; at first they remain united, but as the work progresses their gestures interact, touch, break off and follow individual paths. The gestural language is also related to time; it is as if Vivas has slowed down the heartbeat of the work to focus on the here and now but the women cannot keep from straying — be it to the past or the future — from the sculptural continuum. This is partly intentional and partly unintentional: the attention given to gesture does not always extend to the dancers’ eyes which at times are commenting on the performance rather than expressing the choreography. Nevertheless the choreographic idea remains valid and intact. 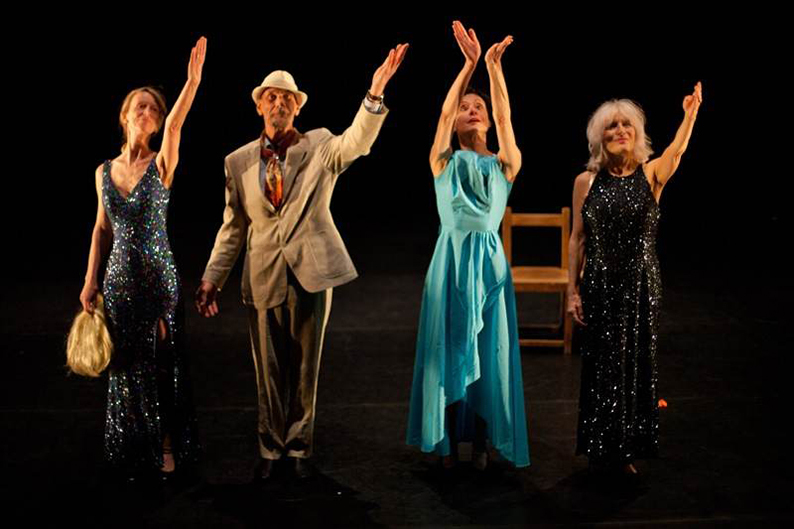 I’m sorry you’re leaving by .2Dot (the duo of Antonio Branco and Riccardo Tarocco) is dance theatre with a rich — not to mention mature — imagination for four exceptional performers: Jill Connick, Roger Cox, Angela Frampton and Gilly Hanna. Based on their lives and stories, it builds on the celebration of the art of age that the Elixir Festival featured last year. The program note reads in part, ‘Real people, with real stories, doing real dances.’ The three ladies in I’m sorry you’re leaving hold nothing back in their embrace of their roles — even if they are telling their own stories — and I can’t help feeling they are giving a fuller account of themselves than they would off stage. As Hanna explains in her guide to introducing yourself, ‘Give an audience an insight into what excites you.’ Roger Cox is less demonstrative but his calm, sometimes diffident exterior and dry humour is a natural counterbalance to the ladies. The stories they each tell, both poignant and funny, have the immediacy of truth delivered in circumstances and (wonderful) costumes that are pure theatre, but their dances and songs are real: Connick’s tap routine, Hanna’s dance to Holding out for a hero, Frampton’s cover of Frank Sinatra’s Fly me to the moon and Cox’s tango with Hanna are highlights of a work that Branco and Tarocco have clearly had fun making. I’m sorry you’re leaving, too; it seems all too soon. Perhaps if the idea had come later you might have made the selection process for The Place Prize. What’s the difference again?